In the past, traditional data centers were mainly established by hardware and physical servers. However, the data storage is limited to the physical restriction of space. Network expansion became a headache for IT managers. Gladly, virtualized data center with cloud computing service has emerged and continued to be the trend since 2003. More and more data center technicians adopt it as a cost-effective solution to achieve higher bandwidth performance. 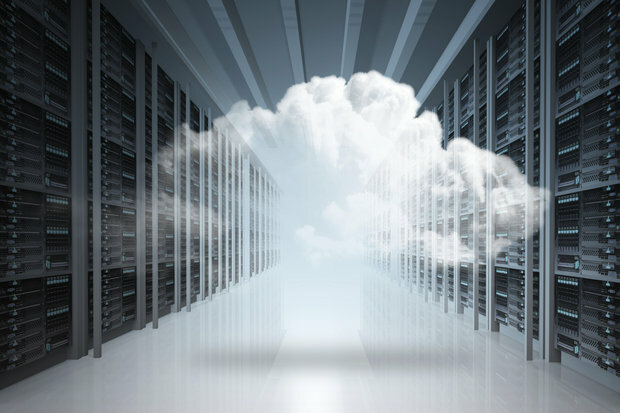 This post will help you to have a better understanding of cloud computing in data center. Cloud computing service is not restricted to one data center. It may includes multiple data centers scattered around the world. Unlike the traditional data center architecture where the network users owned, maintained, and operated their own network infrastructure, server rooms, data servers, and applications, cloud data center is providing business applications online that are accessed from web browsers, while the software and data are stored on the servers or SAN devices. Thus, applications using cloud-based computing are running on servers instead of local laptop or desktop computer. There is no need for users to know the position of data center and no need for experts to operate or maintain the resources in the cloud. Knowing the way to connect to the resources is enough for the clients. Cloud computing brings many great changes for data center networking. 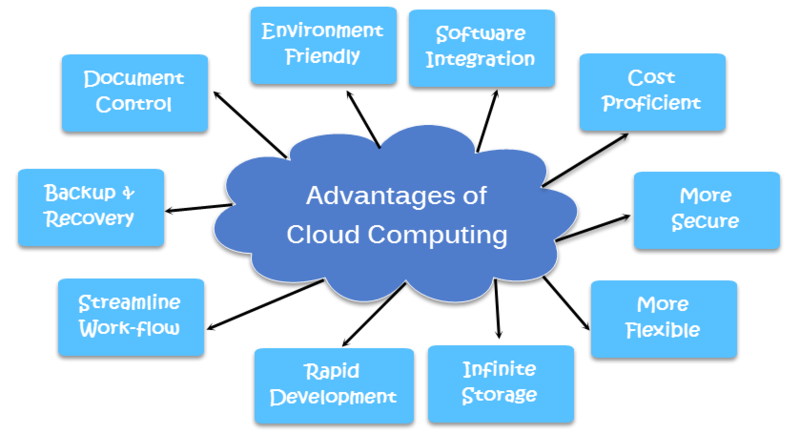 Here lists some key benefits of cloud computing. Flexibility – Cloud computing has the ability to update hardware and software quickly to adhere to customer demands and updates in technology. Reliability – Many cloud providers replicate their server environments in multiply data centers around the globe, which accounts for business continuity and disaster recovery. Scalability – Multiply resources load balance peak load capacity and utilization across multiply hardware platforms in different locations. Location and hardware independence – Users can access application from a web browser connected anywhere on the internet. Simple maintenance – Centralized applications are much easier to maintain than their distributed counter parts. All updates and changes are made in one centralized server instead of on each user’s computer. Cost is always an important concern for data center building. One reason why cloud computing is so popular among data centers is because its cost is much lower than the same service provided by traditional data centers. Generally, the number of cost mainly depends on the size, location and application of a data center. Traditional data center is more complicated by running a lot of different applications, but this has also increased the workloads and most applications are only used by few employees making it less cost-effective. 42 percent of the money is spent on hardware, software, disaster recovery arrangements, uninterrupted power supplies, and networking, and 58 percent for heating, air conditioning, property and sales taxes, and labor costs. While cloud data center is performing the service in a different way and saves the cost for servers, infrastructure, power and networking. Less money is wasted for extra maintenance and more for cloud computing, which greatly raises the working efficiency. Is It Secure to Use Cloud Computing? Data security is always essential to data centers. Centralization of sensitive data in cloud computing service improves security by removing data from the users’ computers. Cloud providers also have the staff resources to maintain all the latest security features to help protect data. Many large providers will safeguard data security in cloud computing by operating multiple data centers with data replicated across facilities. Cloud computing service has greatly enhanced the high performance of data centers by reducing the need for maintenance and improving the ability of productivity. More data centers are turning into cloud-based these days. It is definitely an efficient way to provide quality data service with cloud technology. Field Terminated vs. Pre-Terminated: Which Do You Prefer? Fiber optic termination refers to the addition of fiber optic connectors, such as LC, SC, FC, MPO, etc. to each fiber in a fiber optic cable. It is an essential step in fiber optic connectivity. Nowadays, two major termination solutions including field terminated and pre-terminated (factory pre-terminated) are used to achieve the fiber termination. For these two solutions, which do you prefer? Field termination, as its name suggests, is to terminate the end of a fiber in the field. Field terminated solutions including no-epoxy, no-polish (NENP), epoxy-and-polish (EP) connectors and pigtail splicing are applied on the majority of fiber optic cables today. Field termination not only requires various of steps and tools, but also the proper training and skills of technicians to properly terminate the fiber. Note: pigtail splicing is accomplished by fusing the field fiber with a factory-made pigtail in a splice tray. Factory termination, also called factory pre-termination, refers that cables and fibers are terminated with a connector in the factory. In fact, factory termination has the same procedures as field termination, but all the steps are taken at the manufacturers’ facility. The pre-terminated solution mainly including the fiber patch cables, the pre-terminated cassettes and enclosures features superior performance, good consistency, low insertion loss and good end-to-end attenuation in the system with the design of high-quality connector end-face geometry. In addition, by reducing the cumbersome process and tools, factory pre-terminated solution is easier to install and requires less technical skills. Field terminated solution and pre-terminated solution, with different strengths and weaknesses, are likely to attract different types of users. As technicians face important trade-offs in deciding which method to choose, we are going to provide a detailed comparison between them from several aspects in this section. Field terminated solution needs a series of preparations before termination. Procedures including stripping the cable, preparing the epoxy, applying the connector, scribe and polishing, inspection and testing are required. Additionally, tools and consumables such as epoxy and syringes, polishing products, cable installation tools, etc. are also necessary. Conversely, the pre-terminated solution doesn’t need any cable termination preparation, no connector scrap, no cumbersome tool kits or consumables and no specialized testers needed. Traditional field terminated solution has the lowest material cost with no pre-terminated pigtails or assemblies required, but with the highest labor cost as it takes much longer to field install connectors. For pigtail splicing, though the factory pre-terminated pigtails cost less but the higher labor rates are typically required for technicians with fusion splicing equipment and expertise, or fusion splicing equipment and expertise must be on hand. The pre-terminated solution typically costs more than other options on materials. However, it greatly reduces the labor cost. Because less expertise and resources are required of installation staff. As mentioned above, field terminated solution takes more time in preparation and connectors field installation. In contrast, with pre-terminated solution, connectors are factory terminated and tested in a clean environment with comprehensive quality control processes and documented test results that allows for immediate installation, saving up to 70% on installation time. To sum up, mainly with time and labor saving, the pre-terminated solution can help users save cost at an average of 20-30% over field terminated solutions. In terms of performance, the pre-terminated solution is more stable than the field terminated. Factory pre-terminated assemblies with documented test results are generally available in lower insertion loss and better performance. Field terminated solution works weaker in stability. Because there are many uncertainties in field installation. When for high density applications, the pre-terminated cable assemblies offer better manageability and density which are more suitable for high-density connectivity than the field terminated practices. Field terminated solution, as a traditional termination method, is still used in many application fields. But now, for the case that cable distances are less than 100 meters and cable lengths are pre-determined, pre-terminated solution is more preferred by users. The pre-terminated solution is widely used for cross-connect or interconnect in the MDA (Main Distribution Area), EDA (Equipment Distribution Area), or other areas of the data centre, as well as for fixed lengths in the interbuilding or intrabuilding backbones. Warm Tips: Click here to view the Field Termination vs. Factory Termination in LAN application. Field terminated and factory pre-terminated solutions play a very important role in fiber optic termination, though they have different features. Choose the right method for your network according to your plan. For data center applications, FS.COM highly recommends you the pre-terminated solution as it can help keep costs down and network up, and meets the demands on high density. Contact us over sales@fs.com for detailed information.